Ebrahimipour*, H., Taghizadeh, Z. (2017). Phytochemical investigations and antioxidant activity of Prosopis farcta from South Khorasan. 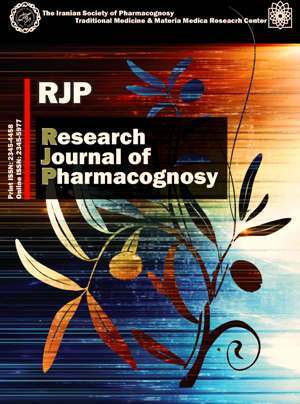 Research Journal of Pharmacognosy, 4(Supplement), 128-128. H. Ebrahimipour*; Z. Taghizadeh. "Phytochemical investigations and antioxidant activity of Prosopis farcta from South Khorasan". Research Journal of Pharmacognosy, 4, Supplement, 2017, 128-128. Ebrahimipour*, H., Taghizadeh, Z. (2017). 'Phytochemical investigations and antioxidant activity of Prosopis farcta from South Khorasan', Research Journal of Pharmacognosy, 4(Supplement), pp. 128-128. Ebrahimipour*, H., Taghizadeh, Z. Phytochemical investigations and antioxidant activity of Prosopis farcta from South Khorasan. Research Journal of Pharmacognosy, 2017; 4(Supplement): 128-128. 1Department of Chemistry, Faculty of Science, University of Birjand, Birjand, Iran. 2Faculty of Pharmacy, Mashhad University of Medical Science, Mashhad, Iran. Background and objectives: The aim of this study was the phytochemical screening and determining the total antioxidant activity of prosopis. farcta a plant native to South Khorasan. It has been mentioned as a cure for diarrhea, measles, diabetes and some other diseases in home remedies. Neuroprotective and relaxing effects, increasing HDL, decreasing LDL and accelerating treatment of superficial wounds are some of its confirmed effects. Methods: Different parts of the plant including leaves, flowers, pods and seeds were harvested. Several extracts were prepared based on maceration, Soxhelt and ultrasound methods which were used for phytochemical analysis and determination of antioxidant activity. An ash solution from different parts of plant was used to measure the contents of mineral elements, phosphorus and total ash. The amount of flavonoids in the plant was evaluated using UV- Vis. method. The total antioxidant activity was estimated by DPPH assay. Results: The results of phytochemical screening revealed the presence of phenolics, flavonoids, saponins, alkaloids, tannin and some other compounds in the leaves. Conclusion: Because of the presence of phenolics and alkaloids, P. farcta can potentially be used for treatment of diseases which are in association whit these compounds.